I’m really excited about becoming an Ambassador for lAM RoadSmart, because improving road safety is a huge and worthwhile challenge.It seems to me that there’s been quite a dive in road safety over the past few years.and that needs to change.I spend a lot of time driving on motorways.and at times I find it impossible to drive according to the Highway Code. Of course I’m also looking forward to doing the advanced driving course. (Ashley completed the course and passed his ADT with a F1rst). I compete for the Team BRIT racing team so I’m used to driving competitively, but advanced driving will mean having to learn from a new rule book:it may be a challenge to separate the two types of driving. I’ve always been a big driving fan and I got into racing last year when I joined Kart Force.a charity linked with Team BRIT. We decided to try to break the Guinness World Record for the longest distance travelled in twenty-four hours in a go-kart. Our team of four drivers clocked up 1888.6 kilometres breaking the record. It was an intense experience, because the go-karts have no creature comforts and we were subjected to massive g-forces driving them. Team BRIT spotted me at last September’s Invictus Games in Toronto where I competed in power lifting and was in the Silver Medal winning wheelchair rugby team. Sport has been really important to me in regaining my confidence and building my fitness since I sustained my injuries in 2010 in Afghanistan. I joined the Royal Engineers in 2007 and went to Afghanistan in 2010, working in a team that looked for and destroyed improvised explosive devices. (IED’s). Four months into our tour I was hit by an IED and It caused serious injuries including shattering my pelvis.I had both my legs amputated above the knee. I’ve had many surgeries since then and was in rehabilitation until 2017. 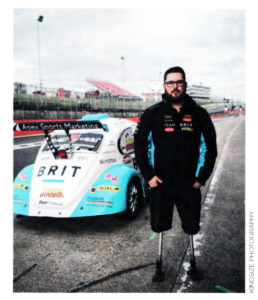 I couldn’t get on with the prosthetics with conventional sockets, but I eventually found out about an osteointegration operation that involves attaching a titanium rod directly to each femur.This means I don’t have to use the usual prosthetic sockets and it also means I can drive a manual car with foot pedals. The Team BRIT cars have hand controls.but I love competing in them. My involvement with the team started in October 2017 when Dave Player, who runs their Fun Cup Team, asked me to take part in a rookie racing day. They were impressed with my driving and asked me to join. I’m also interested in riding motorcycles and am currently building an electric bike based on a Honda CRF motocross machine. I love taking new challenges and that’s why I am looking forward to being an IAM RoadSmart Ambassador. I believe that it will give me the chance to learn important new skills and inspire others to do the same.